Baji Rao's and Chingna Apa's Ghats with the house called Lakshmanbala [Benares]. bl.uk > Online Gallery Home	> Online exhibitions	> Asia, Pacific and Africa Collections	> Baji Rao's and Chingna Apa's Ghats with the house called Lakshmanbala [Benares]. 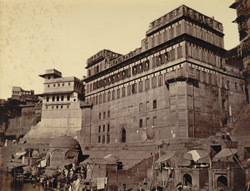 Photograph from the riverside looking towards the substantial building overlooking the ghats from 'Views of Benares, from the River Side' taken by Brajo Gopal Bromochary in 1869. "These ghats are named after their builders. One of the flights of stairs leading up from the Panchganga Ghat enters to this large building known as Lakshmanbala or more popularly Kath ki Haveli, which it ascends and then issues into a lane, at the summit of the bank, leading into the streets of the city. The building although presenting an extensive frontage towards the river, is in reality, hardly more than a casemate to the bank. It is used as a temple and is dedicated to Lakshmanbala (Lakshmana, the brother of Rama). The principal room is in an upper storey, the roof of which is supported on carved wooden pillars of a deep black colour. The walls are embellished with paintings, many of which are representations of green trees."